I tried to go easy on the baking this year, because of being away on Christmas Day. Mother Hand and I are jointly in charge of desserts. She is bringing three desserts. There are five of us and we're there for two days and Mr Z doesn't eat dessert. Therefore, I am bringing cheese. 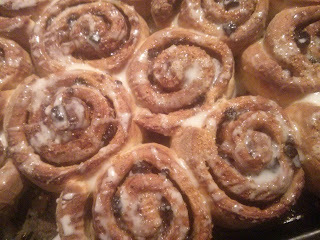 I made these mincemeat Chelsea buns for work in the last week of term; I took them to a department meeting. Here's the result of the Christmas cake I stirred up at the end of November - a fave with Sib (so I'm sure we can squeeze some in, even with all the desserts). Naturally, I made a Tunis cake again. This will probably stay here and wait for our return. 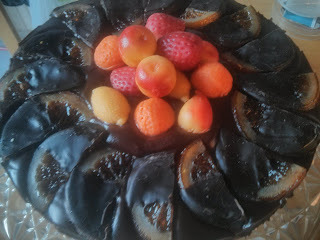 This year I have decorated it with chocolate-dipped candied orange peel that I bought from a patisserie on Piccadilly Circus. It is delicious. 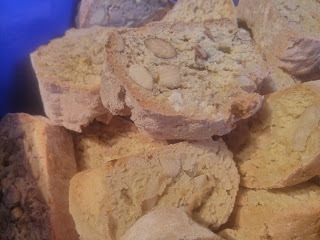 Cantucci biscuits. I have a growing stockpile of dessert wine so these are coming to Sib's with me, and a bottle of Vin Santo, and a bottle of Tokaj (Hungarian dessert wine purchased at Waitrose on a day when I wasn't watching the pennies). These are meant to be made with almonds but I think Mother Hand does not eat almonds, so these are half almond and half Brazil nut. There's a lovely orange, vanilla flavour to them. Yum. Toast the nuts in the oven for five minutes. Chop roughly (but keep separate). 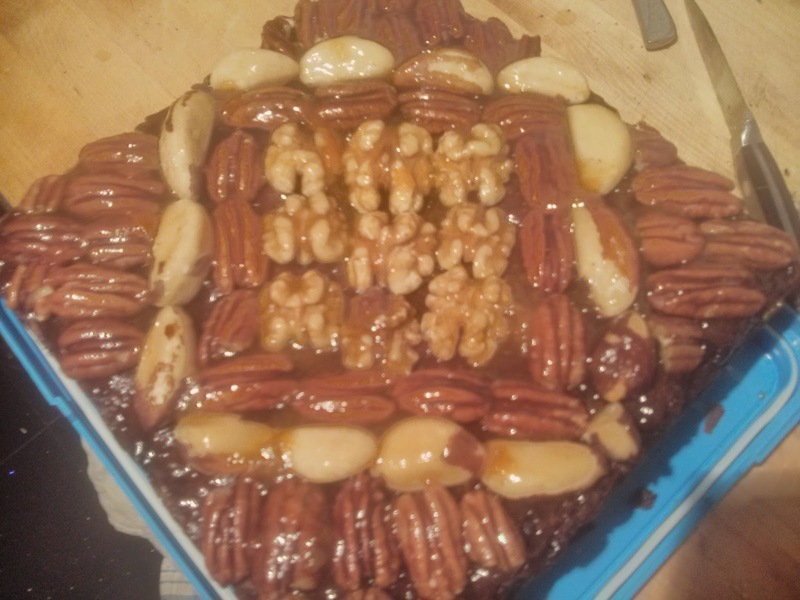 Throw everything except the milk and nuts in the mixer and mix until a dough forms. Add a little milk if necessary - you just want to bring everything together (don't add too much like me, or it will become very sticky very quickly). Divide the mixture in half. Mix the almonds into one half and the Brazil nuts into the other half. Shape into long dough sausages - about 2 inches wide by 1 inch high - and bake at 180 degrees for about 25 minutes, until golden. Leave to cool a little so you can pick them up without risking burns. Slice into 1-inch pieces and place the slices back on the baking sheet. Return to the oven for about five minutes, until golden and mostly dried out. Mine could maybe have done with a couple more minutes but I was worried about getting to tooth-breaking stage. Dip into dessert wine and feel like you're on holiday.